BIODIGEST is made up of natural nitrifying, nitrate reducing and facultative bacterial strains selected for their ability to convert ammonia into nitrites, nitrites into nitrates and nitrates into nitrogen. Biological filtration quickly gets underway thanks to nitrifying bacteria such as Nitrosomonas europaea and Nitrobacter winogradskyi... Aquarium cleaning by waste matter digestion is helped by the presence of numerous different strains of heterotrophic bacteria present in optimal proportions such as Paracoccus denitrificans and Pseudomonas stuzeri... These bacteria work together with each strain finishing off the work started by the others. Some are capable of biosynthesising nitrate reducing enzymes in aerobic conditions. This enables water to be effectively purified, nitrates and phosphates to be reduced and prevents the spread of filamentous algae. WHY SHOULD THE PRODUCT BE USED EVERY TWO WEEKS? BIODIGEST is particularly effective in the first two weeks. The speed at which the bacteria develop differs from one strain to another. BIODIGEST guarantees optimal purification proportions for a fortnight. If you want to speed up the purification process, you should not increase doses but instead should use the product more frequently. 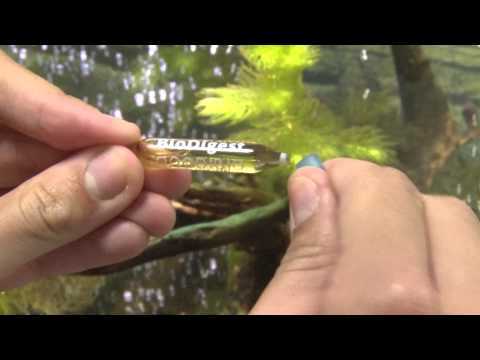 Is it necessary to mix BioDigest (or other product) with water before administering to the aquarium or it can be poured directly into the tank? All products can be used directly into the aquarium. To have a good dispersion of the products in the entire tank, distribute the liquid at the exit of the pump.